One of the easiest ways to get a good audio recording these days is with a portable audio recorder. These vastly improved compact recorders from a wide range of manufacturers avoid audio mixers, cables and a whole package of heavy accessory gear that is often packed in cases and wheeled around. Once a small recorder is mounted to a mic stand (avoid hand-holding it for noise free recordings), what’s involved is the old-fashioned concept of physical placement. The key idea is to move the recorder or the subjects being recorded around to gain the sweet spot. If the recording is of a musical group, it means finding the best position for each player and positioning them around the recorder. This is the way recording began around a single ribbon microphone and still is the most reliable way to capture good sound today. If you’re not a believer, many great music albums were recorded this way. Check out The Cowboy Junkies Trinity Sessions, an album that was recorded with just three microphones. Recording voiceovers, interviews and ambient sound are other subjects that lend themselves well to portable recorders. Anyone wanting to achieve professional results for commercial use should follow these simple rules. When working with portable recorders, don’t spend too much time on trying to get the best audio possible. These recorders can be surprisingly forgiving. The key to place the subjects in the best place around the stereo mics on the recorder. Then listen through headphones. It’s as simple as that. Beyond the basic two-channel models, some recorders allow far more inputs and flexibility. 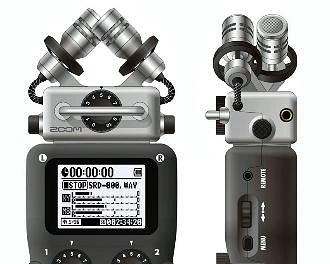 Zoom’s compact Model H5 ($249) and H6 recorders ($399) offer special modules and up to six mic inputs. The H5 features not only features X/Y stereo recording through built-in mics, but two additional XLR mic inputs with 48-volt phantom power. Tascam’s DR-100mkIII ($399) features dual AKM AK4558 converters with Velvet Sound architecture, providing both high sound quality and low power consumption, achieving a signal-to-noise ratio of 102dB. By eliminating interference between left and right channels, signal-to-noise ratio is maximized and audio fidelity is improved. In addition, each of those AD converters can work in a Dual ADC mode. The two AD converters work in tandem then combine their results for a 109dB S/N ratio, beating the already excellent 102dB S/N ratio achieved when recording in standard mode. 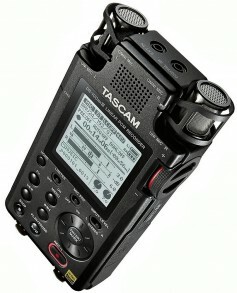 The pair of XLR/TRS inputs deliver the highest sound quality and lowest noise of any Tascam handheld digital recorder. HDDA (High Definition Discrete Architecture) mic preamps are also included to maintain a pristine audio signal path throughout. 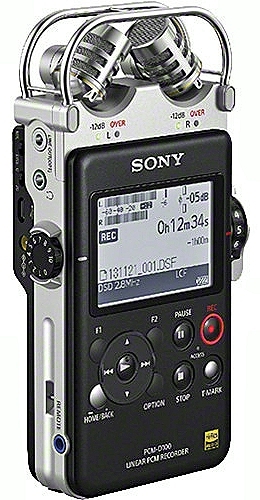 Moving into the super high-end realm of portables is the Sony PCM-D100 High Resolution Portable Stereo Recorder ($774.99). This recorder is capable of recording audio from its built-in stereo mics in up to 192 kHz/24-bit PCM, 2.8224 MHz DSD or 320 kbps MP3 files. It has 32 GB of internal memory and supports external memory via its SD-XC card slot. The PCM-D100’s stereo mics can be arranged in 90-degree XY or 120-degree wide stereo positions, depending on the subject being recorded. The recorder is powered by four included AA batteries and can record approximately 6.5 hours at 192 kHz/24-bit PCM and almost 11 hours as 2.8 MHz/1-bit DSD. Its left and right record channels are individually adjustable, and its meters are illuminated for monitoring in dark environments. For faster transferring of files, the PCM-D100 has a USB port, allowing users to move files directly to a Mac or PC. A wireless IR remote commander, furry windscreen, USB cable and carry case are included. The current generation of portable recorders, beginning at about $100, are the best recording devices ever built. They are now perfected and easy to use. Many models record separate backup tracks at a lower volume rate to avoid digital overload. The key is using these recorders correctly. Old school mic placement is fundamental to excellent recordings. Spend the time to learn the correct techniques and you’ll be rewarded with excellent recordings.